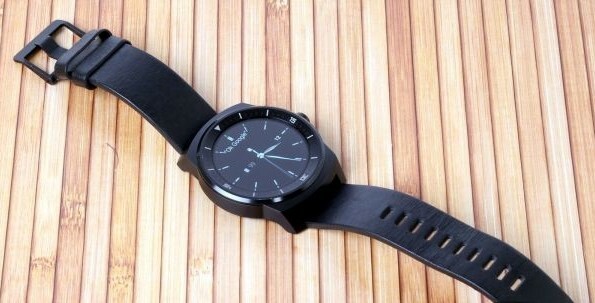 LG designers managed to make smart metal watch with all round display! Recall that the first round smart steel Moto 360 hours, but if the developers wanted to make Motorola and display all round, then they could not: he was cut along the chord at the bottom. The fact thatthe antenna away completely metal body, so that they can be had something to transmit and receive normally impossible. Therefore, part of the display at the Moto 360 had to be sacrificed in favor of a plastic insert, and is located under which wireless filling device. LG engineers find another solution – made of plastic rear housing side which is adjacent to the arm and is not visible during operation. Of course, the company carefully accentuate attention on this, and in all marketing materials emphasize what LG has created the first hours on the Android Wear with a fully circular screen. Call them G Watch R, in the US they cost $ 299 versus $ 249, which is asking for Moto 360, and it is their today and we are considering. Round display really looks great, especially if you choose a good theme. But the clock on the official photos looked much better than the reality. For a start they are quite massive – its thickness is 11.2 mm, more than a centimeter! The housing, not counting the bottom panel on which contacts are arranged for charging and pulse meter box, made of metal, but due to the fact that it is colored, visually perceived as plastic. Actually, LG G Watch R, as the “Ford” may be any color, provided that the color is black. Or black with gray insert. That’s just the paint chipped off very easily: it is necessary to touch the clock any subject – and in place of chips comes out shiny metal. As a result, the device quickly loses its presentation. The strap is made of thick genuine leather without the decorative looks more solid of the clock, but is unlikely to attract the attention of lovers of status or even beautiful things (and the clock, recall, is almost the only men’s jewelry). However, it has a standard width of 22 mm and mounted in the same way as in conventional clock, if desired, so that it will not be easily replaced by another. However, the clock is black or black metal bracelet or black leather – plastic and colored straps do not look, so choosing the owner of G Watch R is somewhat limited. Moreover, regardless of what you set the dial, LG G Watch R will never appear as classical watch – as most sports. But, as befits an hour, they are protected against water and dust – in this case, according to the standard IP67, ie they can be short and shallow to swim. About the shower and washing dishes (IPx5 – protection against water jets) LG did not mention, but most likely, pressurized water G Watch R is also not afraid. 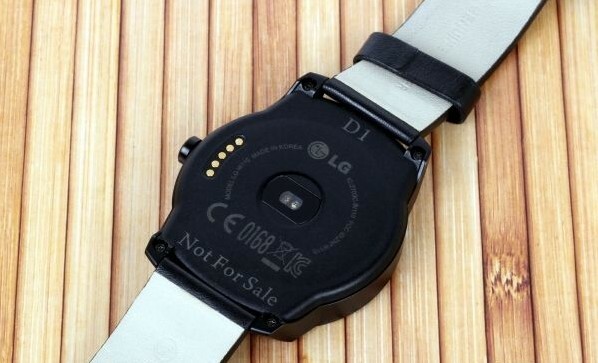 Design LG G Watch R differs small number of small decorative elements. Front visible only white risk side – the button every time you want to turn like a normal pen winding mechanical movement, although it does not rotate. On the back side there are five contacts to connect to a docking station and peephole heart rate monitor. On hand LG G Watch R sitting generally okay, but the author of this review for all the test did not succeed with them “grow together” – to forget that they are on the wrist. Any movement of the left hand – and the clock immediately felt. They are not heavy enough to strap pleasant to the touch – like no prerequisites for discomfort. Apparently, the effect sizes: gadget still rather big. 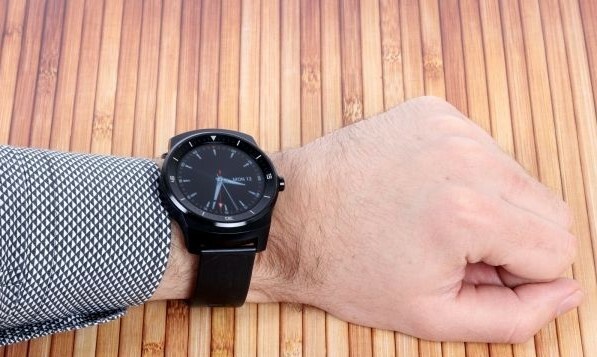 Charged LG G Watch R using the docking station, the size and thickness are similar enough to the watch itself. The device is placed on a cradle and is retained therein by means of a magnet. Proprietary charging – not the best solution: it should not forget to take with you on trips longer than two days, and in any case can not be lost – without it smart watches “turn into a pumpkin.” But LG is not alone in the application of this approach – most intelligent hours required for charging additional devices, whether wireless charging station at the Moto 360 or the same unit with five contacts from LG G Watch without the letter R in the name – except that the rectangular, matched by hours. Apparently, the place Micro USB port on the case is not to the detriment of size, reliability and design is almost impossible. But behind the display round the clock really can be forgiven much. LG G Watch R equipped with a display with a resolution of 320 × 320 pixels, although it would be truer to say – with a diameter of 320 points. In fact, with the software point of view, the first option rather as a picture in the “brain” clock is created, of course, the square – absolutely the same as for all other hours with square screens. But in the case of LG G Watch it clipped to the square inscribed in a circle – the screenshots (which also, of course, turn out square) border can be seen on the display image. The rest is drawn, but only in video memory device. The diameter of the display screen, performed on the basis of a matrix of polymer organic light emitting diodes, is 1.3 inches. Since the virtual display in G Watch R square and its resolution is 320 × 320 pixels, it is possible to calculate the density of the points – it turns out that the diagonal of the virtual display is about 1.84 inches, and the density of the points, respectively, about 246 PPI. 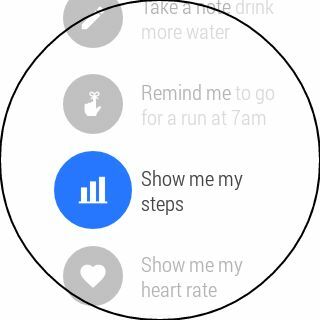 And for smoothness, this is clearly not enough, and antialiasing Android Wear have not yet learned: arrows are obtained entirely in the ladder, small fonts look blocky. 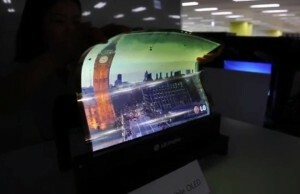 But P-OLED-display, even though he concedes the usual SM-OLED in energy efficiency, gives a bright, saturation and contrast image.Black, by itself, does not light up at all hours in the case allows for a certain effect of depth: it seems that the arrow slightly raised above the surface of the screen. In LG G Watch R has six levels of brightness: comfortable use for hours already at the minimum, and maximum they do not fade even in bright sunlight. The colors, of course, chilly (our colorimeter does not fit on the tiny screen of hours, so we give only a subjective assessment), but this can be forgiven hours – after all, they do not watch the movie. The main thing is that the image of juicy, and the black background is black – IPS-matrix with backlight glows from the diodes on the edges would look awful, OLED looks much nicer. Oleophobic coating on the screen is, but the anti-reflective layer, it seems, is not provided, although without the image remains legible. Since the program for round and square clock features the same, there is a risk that part of the interface elements simply do not fit the physical display – all the screenshots will be seen as a user, as in the example below, will get only a stub of the inscription. Therefore, Google offers to use only part of the screen to display important information and interface elements. To not have to work in polar coordinates, it is proposed to restrict the square inscribed in a circle of the display. 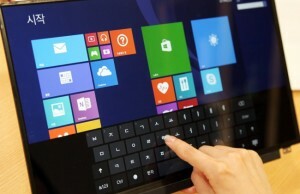 However, this is only a recommendation and it concerns only interactive interface elements. In terms of filling LG G Watch R practically the same square G Watch – and this is more correct: power Qualcomm Snapdragon platform 400 this tiny gadget grabs his head as 1GB of flash memory and 512 MB RAM. Quad-core Cortex-A7 paired with Adreno 305 graphics and calmly cope with screens of 1280 × 720 and even allow you to run on smartphones 3D-games, to say nothing about the clock display with 320 × 320, which is no 3D, and not in the near future there will be. It’s all just flies. Watch with a smartphone connected using Bluetooth 4.0 LE: Cellular Modem they do not like no Wi-Fi, or GPS. And do not be: the clock is not set up to replace the phone. A set of sensors can be called exhaustive: gyroscope, accelerometer, digital compass, barometer and a heart rate monitor. Due to all this diversity, as well as with the ability to receive data from GPS-smartphone clock allows to calculate and display other useful information – for example, they have an altimeter (seems to be using GPS) and a pedometer (based on gyroscopes and accelerometers). The most interesting feature is a heart rate monitor, but it is not too accurate: in the intimate moments of time at a constant state can produce variation in more than 10 beats per minute. A 60 and 80 – is quite different and quite different pulse condition of the body. Of course, the vibration is there, and quite powerful – it can not only feel, but also to hear. The dynamics of hours there, although there is a microphone: they hear, but do not talk. It’s probably a good idea: if they are still talking, a small battery 410 mAh discharged would be faster. And LG G Watch R is enough for about a day and a half to the permanently turned on minimum brightness and screen somewhere for three days, if we let the screen off.This is slightly less than the square LG G Watch W100, which are due to the smaller screen resolutions are more economical.Nevertheless, it is a good result: Moto 360 and Sony SmartWatch 3 live on less. LG G Watch R running Android Wear, which completely determines their software capabilities and wrap if you do not take into account the various dials, some of which are made exclusively for the first and only round hours. LG made sure that the user can pick up the dial on your taste: choose to be more than twenty switches, planetary, and combined digital display options of time. Some dials can derive additional useful information: the number of steps you’ve walked, compass, altimeter. Android Wear in this case – it’s good and bad at the same time. Good because it is standard – to round the clock will not have to get used to after the square, and indeed this interface should gradually become familiar to users. In addition to Wear will definitely be leaving the application, the system will be improved, and the clock – updated the benefit of Google did not repeat the mistakes of youth and committed all watch manufacturers to use a single interface. Bad, because at the moment this interface still needs some work and is not always convenient. In addition, the basic version of Android Wear lacks obvious, in our view, functions like a smart alarm clock or phone lookup. And if the second function is achieved using a simple and free application Wear Buddy, albeit unfinished, but it works as it should, then use Wear as a smart alarm clock app yet only knows how to Sleep As Android, and does it badly. According to the owners of smart watches, modest size batteries wearable electronics is not enough to satisfy the appetites of the program, resulting in any member of the family of Android Wear sits less than eight hours, leaving the user without an alarm clock. In general, Android Wear at this point is something like Android 1.6 – is already running, but to the state of a full-fledged operating system, which is a pleasure to use, it is very far away. 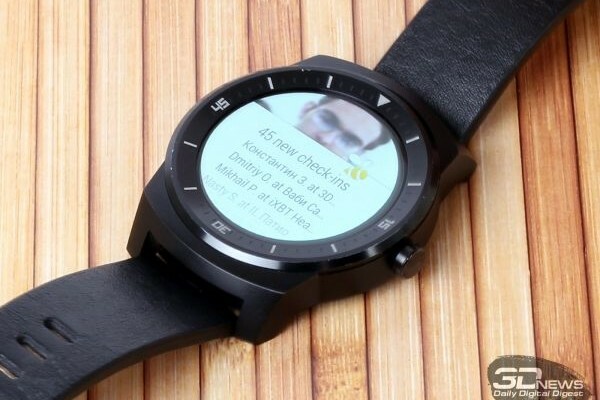 And efforts are needed as most of Google, and from application developers – without the clock on the Android Wear are still not intelligent, they are able to broadcast unless notice. For example, it would be useful for applications such as Lifelog Sony SmartWatch 3. There is only standard on all smart Google-hour program, with which the clock is convenient to set up, but look at all sorts of statistics will not work. Perhaps, LG would cost to create their own such an application. LG G Watch R – the first truly intelligent round the clock. And this is a step in the right direction – the clock with square screens still less familiar and still perceived as gadgets for geeks, while in round specimens have a chance to attract a wider audience. However, this is only the first step – LG managed to make a round mold and place the stuffing hours so that it would fit her, but designers still have to work hard to make these watches looked the same thoroughbred like real mechanical timepieces. LG G Watch R more productive and live longer battery life than the Moto 360, look better than square LG G Watch, and allow the strap to choose according to your taste, unlike Sony SmartWatch 3. They have no additional interfaces such as Wi-Fi and GPS – but whether they are necessary at all? Yes, the price bites – in Russia the average cost of G Watch R is 16 990 rubles, which immediately on 6000 more than asking for absolutely similar in all but the form and display, LG G Watch. As the clock on Android Wear yet so much, LG G Watch R – taking into account these advantages – are automatically among the best. It is not clear whether at this stage to give preference to Android Wear, but if you are sure you want to become the owner of smart hours on the platform Google, you G Watch R – the most perfect option.